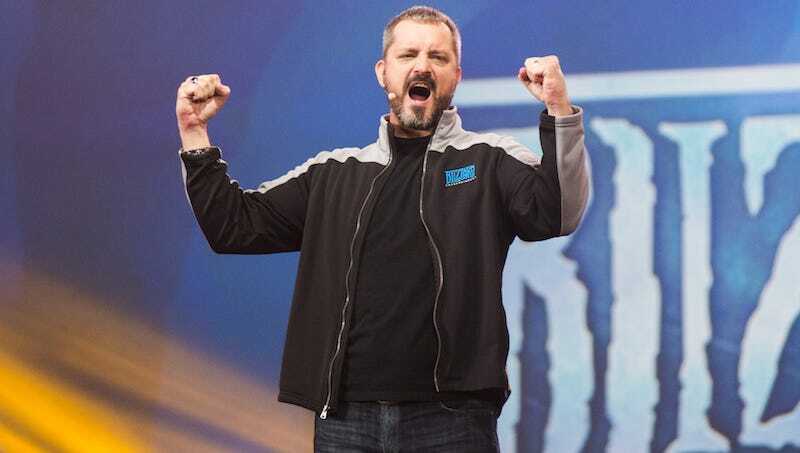 Blizzard’s lord of lore (and sunglasses), Chris Metzen, is retiring from video games. Metzen is primarily known for two things: 1) giving speeches at BlizzCon that would put most video game characters to shame, and 2) helping mold the worlds of obscure games called Warcraft, StarCraft, Diablo, and Overwatch. One could also argue that he’s Blizzard’s daddest dad to ever dad, tied only with Overwatch’s Soldier 76, a character Metzen himself created. So for now, he’s retired-retired, as opposed to, say, joining Rob Pardo’s new company. Speaking personally, it’s bittersweet to see him go. His stories weren’t always amazing, but you could never accuse the man of lacking enthusiasm. He helped build the worlds that shaped my imagination as a kid. I constructed (terrible) StarCraft levels by day and drew WarCraft characters by night. I was obsessed. I doubt I’d be working for Kotaku today if not for the influence of Blizzard games and worlds on my impressionable young mind. Thanks for that, Mr Metzen, and good luck.